A good freezer bag meal will come to your rescue on busy weeknights and when cooking for a friend in need. Taco chicken is family friendly, endlessly versatile, and quick to prep. Last year I turned the bags into practical gifts for several friends, because who couldn’t use a healthy meal and a night off cooking amidst the busy holiday season? It was the morning after Halloween, and my family was eating breakfast to the background banter of a daily news show when a reporter mentioned that the 55 days of Christmas were officially underway. He was joking. Everyone knows it’s the 12 days of Christmas – at least it used to be! Unable to find commercial success in turkeys and pilgrims, corporate America largely bypasses Thanksgiving. But whether you check off the items on your holiday shopping list early or are a procrastinator like me, the hardest part of the job is often figuring out what to give in the first place. Determining what might be the perfect gift for the important people in our lives is no easy task. Does he really need it? Where will she put that? Do they have one already? That’s really expensive! The older I get the more I realize that the gift of food cannot be overrated. It’s perfect for those who don’t really need more “stuff” but it shows you care. And isn’t that what the holidays are all about? My family makes quick work of the canister of jumbo cashews, the box of Florida Honeybells, and the package of smoked salmon that are the yearly gifts of several family friends, and a bottle of olive oil is a practical alternative to wine that always gets used. For those who have the time and inclination, a homemade touch offers special appeal. Over the years I’ve given salted hot fudge sauce, roasted nut mixes, and the fixings for overnight sticky buns that can be popped in the oven on a festive morning. There’s a crowd that welcomes homemade dog treats, aromatic hand and body scrubs, or a big jar of granola. But of all the homemade treats I’ve concocted, items that can be served for dinner seem to be most appreciated. More than just a meal, a jar of homemade spaghetti sauce or a quart of hearty soup can feel like a gift of time at 6:00 on a busy day. Many of these gifts can also be stashed in the freezer for future convenience. As an added benefit, a wholesome, home-cooked meal can provide welcome balance amidst the decadent dips and fresh-baked cookie plates that are so darn tasty and often feel like an ever-present temptation this time of year. I’ve given the following recipe in years past to friends who have appreciated that the meal basically cooks itself with the help of a slow cooker. The customizable meal isn’t an especially glamorous gift (a pretty bow helps! ), but it’s family friendly and aside from some cooked rice or tortillas for serving, everything needed for a healthy meal is in the bag. Because the gift giver’s time is just as precious as that of the recipient, the ingredients can be assembled in advance and stored in the freezer until ready to give. Beyond the holidays, consider this recipe when cooking for someone who just had a baby, is sick, or would simply appreciate an unexpected act of kindness. I have always prepared this in my Crock Pot, but I’ve included oven equivalents below the recipe for those who may not have a slow cooker. 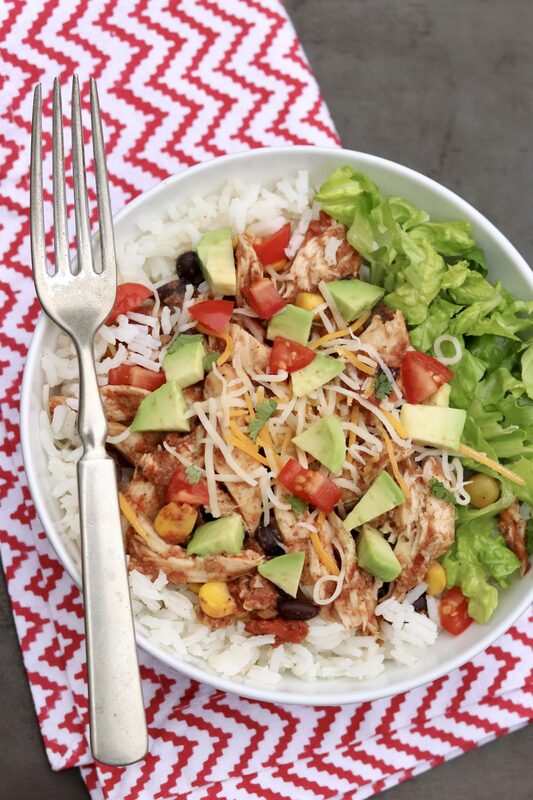 When giving as a gift, jot down the cooking instructions and mention that the flavorful chicken mixture can be served over rice, in tacos or in burrito bowls. For easy reference, write the cook time directly on the freezer bag with a Sharpie. To round out the meal, consider including some of the optional items for serving, like rice, a package of tortillas or tortilla chips. When intended for immediate consumption, fresh options like shredded cheese and/or guacamole provide added appeal. Of course, most of us appreciate an easy meal at the end of a long day, so be sure to stash a bag or two in your own freezer, too! I typically use the flavorful chicken mixture in rice and veggie bowls, but it works beautifully in tacos and burritos – or as is with a side of tortilla chips! 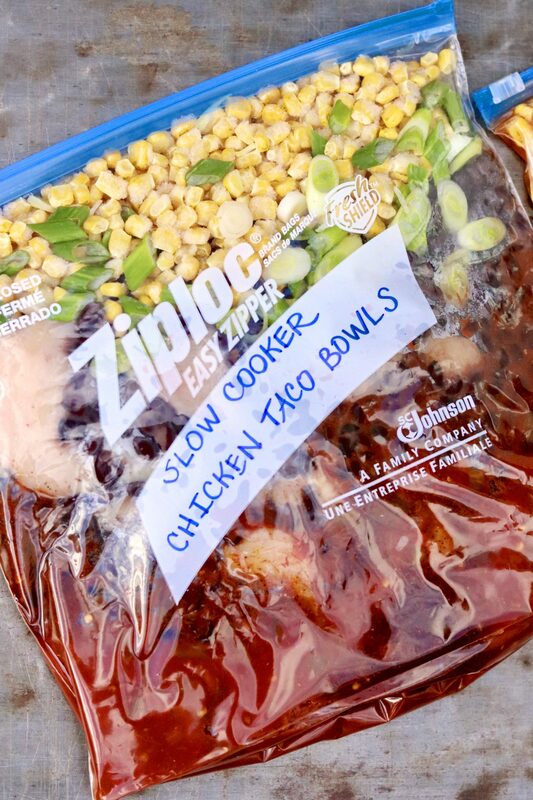 To make freezer bag: In a gallon size zip-top bag, combine the chicken, salsa, drained beans, corn, scallions, taco seasoning mix, and optional jalapeño. Place in freezer for up to 3 months. Tips: Recipe can be multiplied easily to make as many freezer bags as desired. The freezer bags store more efficiently and thaw more quickly if frozen flat. 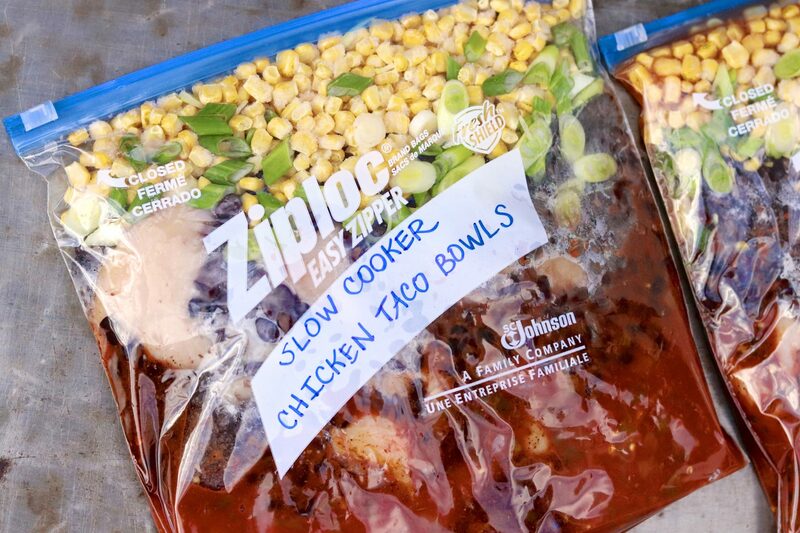 To cook: If frozen, thaw the freezer bag overnight in the refrigerator, and then transfer the contents of the bag to a slow cooker. (Hint: Swish out the contents of the bag with a few tablespoons of water and add that to the cooker to make use of all the salsa and spices.) If cooking immediately, simply place the ingredients (chicken through optional jalapeño) in the slow cooker. Cover and cook on low heat for 4-6 hours (or 2-3 hours on high heat) or until the chicken is cooked through and tender enough to be pulled apart easily with two forks. At this point, remove the chicken to a plate and shred with two forks and then return it to the slow cooker. •You could cook 6-8 chicken breasts halves at one time if you prefer to serve them as whole breasts topped with some of the salsa mixture or simply to have extra chicken for leftovers. The recipe as written above, however, is based on chicken weight in order to provide a good chicken-to-sauce ratio, which is more important when shredding the chicken and mixing it back into the sauce. •For a cilantro lime twist, I stir in 2 tablespoons freshly squeezed lime juice along with the zest of one lime and 1/4 cup chopped fresh cilantro (or more to taste) at the end of cooking time. 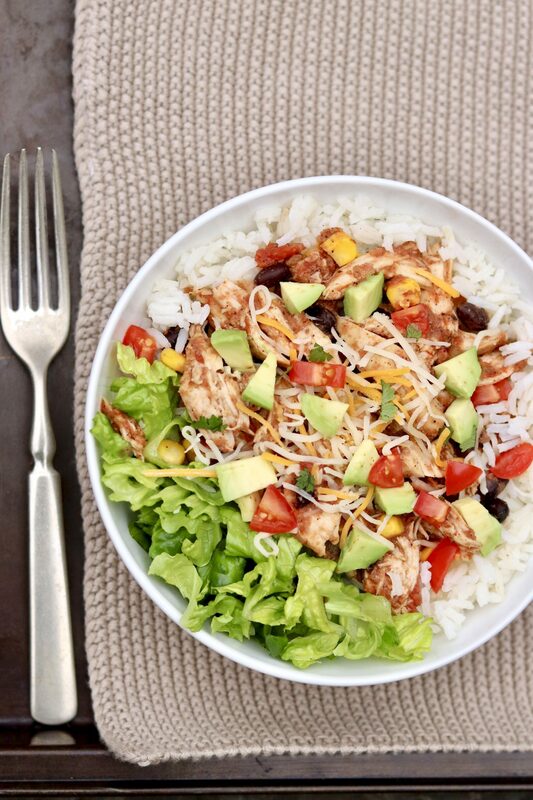 •Serve the chicken mixture over cooked rice, cauliflower rice, or build your own burrito bowls with optional toppings of choice. •Stuff the chicken mixture into hard taco shells or soft tortillas that have been warmed first. •When making taco bowls, I often include a green component like chopped romaine lettuce or shredded cabbage. As another possibility, my Cumin Lime Coleslaw recipe is quite easy and complements nicely. Many slow cooker recipes call for 8 hours, even 10-12, on low heat, but newer cookers tend to cook much more quickly than older models. If you think food seems overcooked whenever you use a slow cooker, you can likley overcome this by simply checking for doneness an hour (even 2 or 3 hours) earlier than usual. Also, slow cookers are designed to be filled 1/2 to 2/3 of the way. When filled beyond this point, recipes will generally require additional cooking time. When slow cookers are under-filled, recipes tend to cook quicker. Adjustments for cooking in the oven: I have not cooked this recipe in the oven, but I have adapted other slow cooker recipes for the oven, using a Dutch oven or another heavy, tight-lidded pot and an oven temperature of 200°F for low heat and 300°F for high. Another rule of thumb is to divide the amount of hours a recipe needs to cook on low in a slow cooker by 4 and cook for that many hours in an oven set to 325°F. For example, a dish that requires 8 hours on low in a slow cooker will take roughly 2 hours, covered, at 325°F. 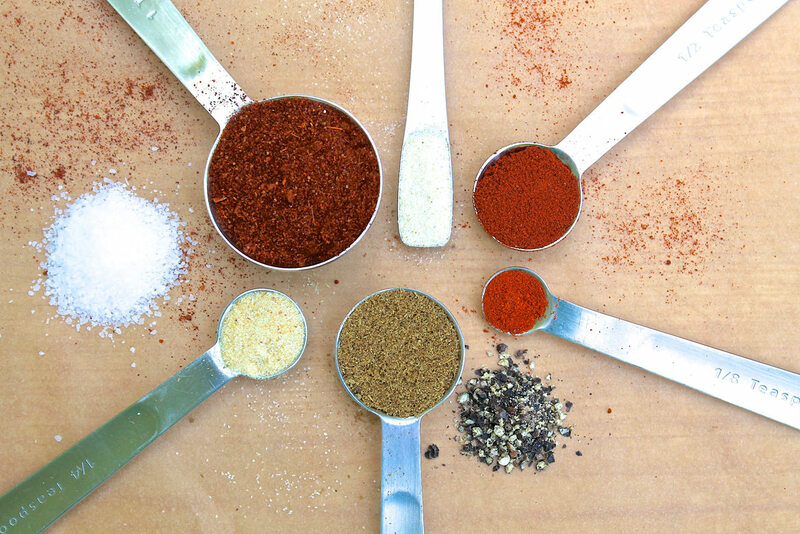 Homemade Taco Seasoning ⇩⇩ is a breeze to make with spices you likely have on hand. I like to prep several small jars at once to use as needed. 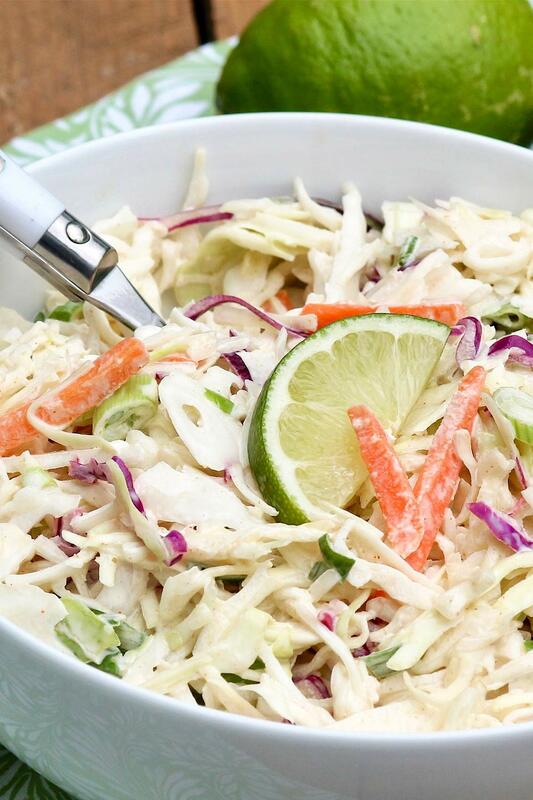 Cumin Lime Coleslaw ⇩⇩ takes minutes to make and adds crisp crunch and great flavor to south of the border fare like homemade burrito bowls, fish tacos and pork carnitas. Or simply enjoy as a crowd-pleasing alternative to a green salad. Hi Patricia, You don’t actually cook it in the bag. 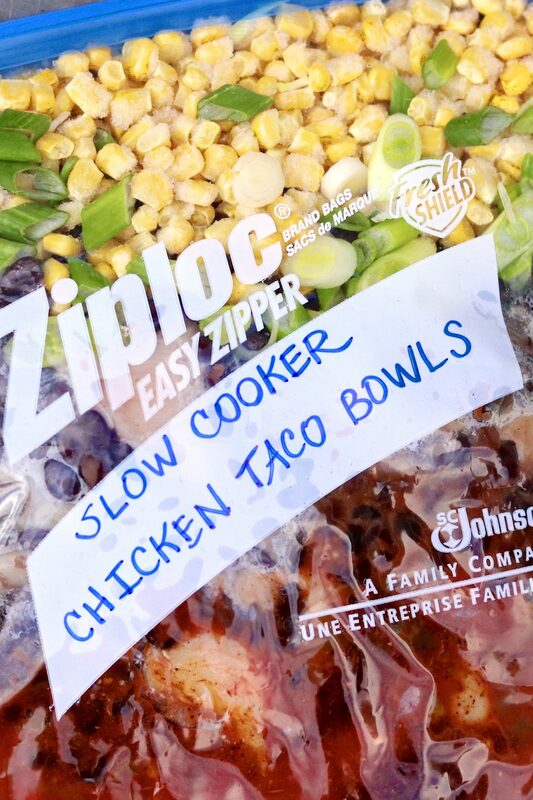 The zip-top bag is an option if you’d like to make it ahead and freeze. Using leftover turkey and putting this in the freezer for a later date! Will cook a little less time, since the turkey was already cooked. Don’t want it to dry out! Thanks! Sounds like a great idea, Sandi. I should do that, too!